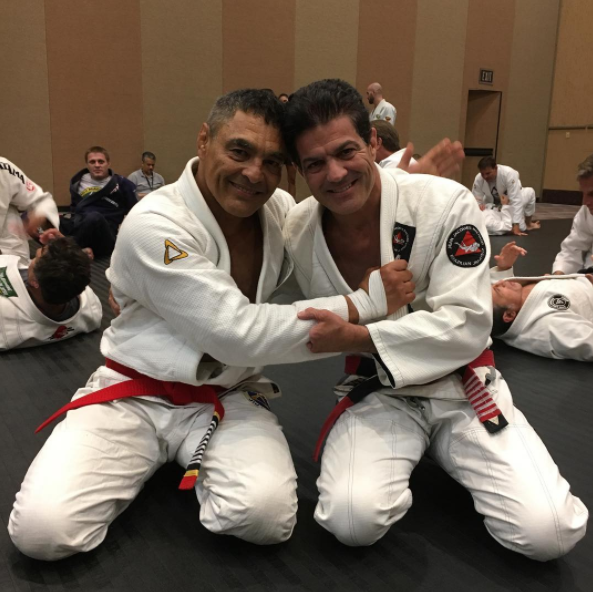 Rickson Gracie has been promoted to red belt by his brothers and other high-ranking members of the jiu-jitsu community. Rickson's older brother Rorion was the one to orchestrate the promotion, accompanied by younger brother Royler and well-known figures such as Jean Jacques Machado, Pedro Sauer, Fabio Santos and even 9th degree red belt Alvaro Barreto. Former UFC heavyweight champion Fabricio Werdum also attended the ceremony. Rickson was originally promoted to black belt in 1977 at the age of 18. With forty years of experience at black belt, he expressed no small amount of emotion in being presented with the red belt. Rickson used his promotion speech to call for unity and consistency among the jiu-jitsu community in standardizing promotion requirements, explaining that he felt that if the standard guidelines had been followed he should have had to wait a total of 45 years as a black belt before receiving the red belt. Rorion and Alvaro Barreto explained that the belt in the case was symbolic of the journey Rickson had undertaken, with no doubt in anybody's mind that it was fully deserved.